How much oil is created each year? We all know that oil is an essentially nonrenewable resource over human time scales. However, I am currently working on an activity for high schoolers that teaches them to predict how long humans can continue extracting oil before running out (and what a sustainable rate of extraction would be). To that end, does anyone know roughly how much oil is created each year, (in the entire crust, no matter how inaccessible)? All you need to calculate the oil production is an estimate of the volume of host-rock that is currently under those conditions in sedimentary basins around the world. As you can see there is a staggering area of Earth covered by sedimentary basins, and all those basins have a certain volume under oil generating conditions. You will probably also need a rough estimate of how much oil can come out of an average source-rock, and how much will be trapped in economically profitable host-rock traps. Maybe a factor that takes into account the basin type, would also help to improve the calculation (Compressional basins would have a lot of antiform traps, while extensional basins have tilted bed traps). I have the feeling that the total oil inventory of Earth is probably a Logistic function. Once all the oil traps are filled all the excessive oil is lost to migration or too much heat. Empty traps would mean that oil would find a place to accumulate. So it might even be a self-stabilizing system (but not in human-time-scale, but let's see how long we last). I think that this would yield an order-of-magnitude answer. It is possible that somebody already made these calculations and I would love to see the numbers. Footnote: Oil, like all resources, follows mining economics. If you earn money, you mine, if you loose money, you leave. This also means that if more money can be earned, there are also more deposits worth the effort. 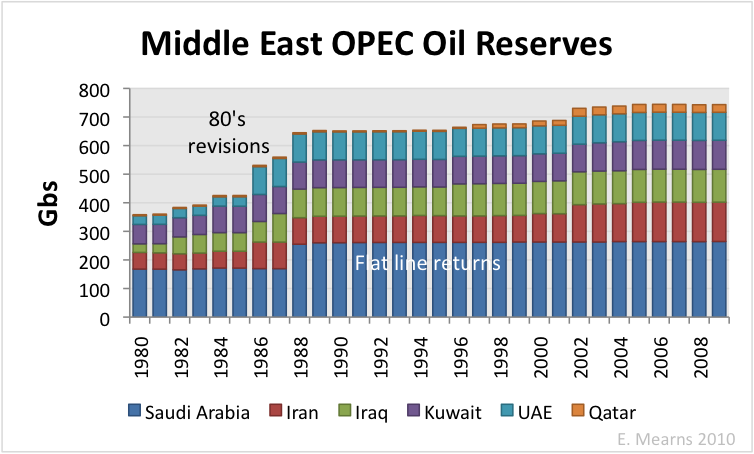 Calculations with today's reserves are almost useless, because they can't predict what people will be willing to pay for oil in the future. Even if mining becomes unprofitable, we might produce synthetic oil, just because it is a convenient chemical (energy stored in relation to mass, diffusivity, and danger). We kind of already have that with rapeseed oil, which sadly can get a better price to power rich countries cars, than feed poor countries people. +1 Nice answer, though appears I have misunderstood your theory that price changes correlate oil reserves, since it appears to be flawed given a review of Inflation Adjusted Oil Prices from 1946 to 2012 appears to show no fixed correlation to reserve estimates. 12.5% of oil and gas is from organisms that lived 5 to 34 million years ago. So if we take an estimate for the total oil in place before human extraction of 4 trillion barrels, this would be 500 billon barrels. 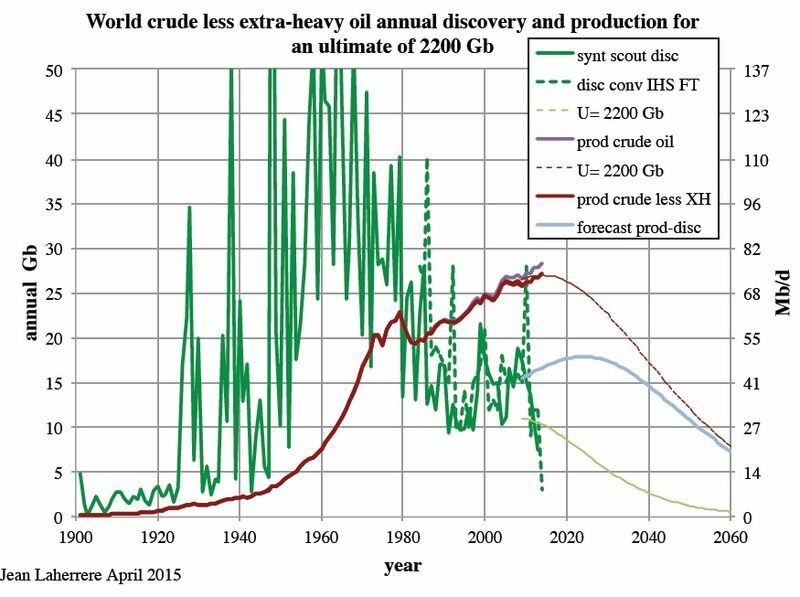 So a crude estimate might be 500 billion barrels per 30 million years or 17,000 barrels per year. Around 80,000 barrels per year? The unproven (known reservoirs that are non profitable under present economic and technological conditions), may account for 4 times the proven reserves. Let's label that factor as UPFC=4. If you assume that we are around half way of discovering all oil reservoirs accumulated on the Earth's sedimentary basins, then you just have to divide by the 250e6 years they took to form. Note that this is the average Mesozoic+Cenozoic oil formation rate minus the average oil degradation rate (oil is also lost after its formation through different natural processes). Related answer at http://earthscience.stackexchange.com/questions/2503/how-much-fossil-fuel-came-from-the-carboniferous, quotes Klemme and Ulmishek: "Six stratigraphic intervals, representing one-third of Phanerozoic time, contain petroleum source rocks that have provided more than 90% of the world's discovered original reserves of oil and gas (in barrels of oil equivalent). " That is, most of the processes that created our current oil supply ended more than 100 million years ago. @jeffronicus I don't see how you arrived art your conclusion based upon what you quoted. Notice that the oligocene+miocene (with 12.5% of reserves) lasted 28 my where the Cretaceous (with 29%) lasted 79 million years. I discount the "middle" qualifier on "Cretaceous" because geologists generally don't definite a "Middle" Cretaceous. @Imtherealsanic Barrel#Oil_barrel) is a liquid measurement unit. The laboratory process to create oil from kerogen involves removing any oxygen, sulfur, or nitrogen from the reaction. Conditions in the real world which allow this to happen are practically nonexistent.